I started off the day thinking that it is time to make some soup! The cold weather is a good time to have some homemade soup for those snow shoveling days. You can keep it in the refrigerator for about a week, so you may want to make a few quarts to freeze for those days when you need some warmth. I began my soup adventure by chopping some celery. 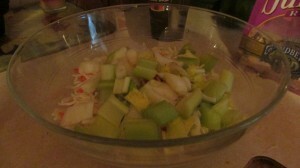 I used a cup of celery, cup of chopped cabbage and 1 large white onion chopped. I also added a slice of 12 grain bread that I purchased without high fructose corn syrup. All natural for 4 grams fiber and another 5 grams protein! The beauty of making soup is that it can help you with increasing the fiber in your diet. Did you know that there are many studies on the fact that people who eat soup are thinner? Why not give soup a try. Some recipes that are good and packed with protein include adding grains, legumes and beans. 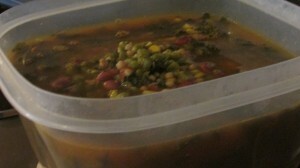 Here is a recipe for a great veggie soup with kidney beans, split peas and kale. Veggy Soup for the Cold Days Coming! I love soup, and I am glad it is the time of year to make some. It warms you up after being out in the rain or snow. There is also a belief that people who eat soup are thinner than people who don’t, so get on the bandwagon, and make yourself some soup. I start with a clove a garlic and some olive oil, I also add some crystallized ginger ( or fresh) to the skillet and simmer until golden. I next add a can of V-8 juice, 4 ounce can- low sodium , and fill the can with water. So you have about 8 ounces of liquid. I next add my veggies. I love spinach and cabbage.